I never was a purse kind of girl. I had one back in my teenage years, but since it was too small to hold a book, I ditched it. Not a problem because up until last year I almost always had some sort of school bag with me which held everything I needed. In its absence, I used reusable shopping bags, totes, and pockets. Worked for me! A few weeks into baby N's life, I realized how tiring and inefficient it is to be running around the apartment, collecting baby paraphernalia and my own wallet/keys/cell phone every time we wanted to go out. I had to face the truth: I needed a bag to keep it all contained. Permanently. I did try throwing the lot into my favourite tote, which resulted in a large tangled mess. I had to come up with something a little more organized, but I wasn't too keen on the generic diaper bag. 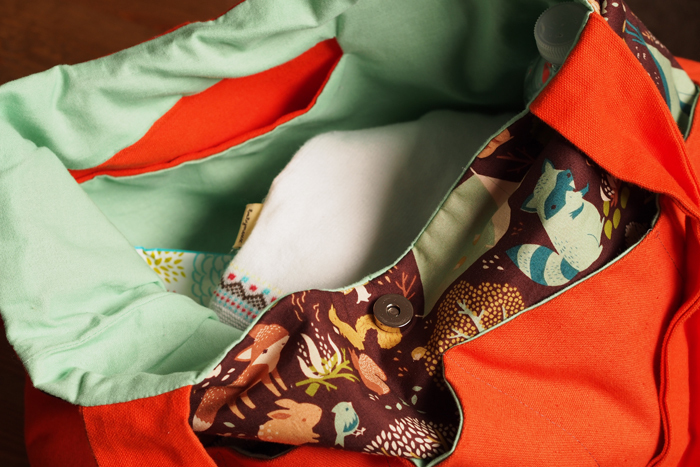 I found this lovely diaper bag pattern by Amber from Make Baby Stuff.com and instantly knew that this was a diaper bag for me: it looked simple, spacious, and relatively simple to make for the sewing noob that I am. I printed the pattern, gathered supplies... and many days later, after having ripped out the stitches for the twentieth time (no, really), I had myself a bag that I love and enjoy using. Tadaaa! And I got something useful in the end! Win win! Don't you like beginner projects that actually lead somewhere? I remember looking at all the crocheted washcloths and wondering what ever will I do with these? Of course, if you actually use washcloths, then you probably won't share my puzzlement. - I should have heeded Amber's advice and added a velcro strip on the back pocket (not pictured here), as it is too flimsy to keep anything heavier than a handkerchief without opening up. Shame, because it is a nice large pocket with lots of potential. 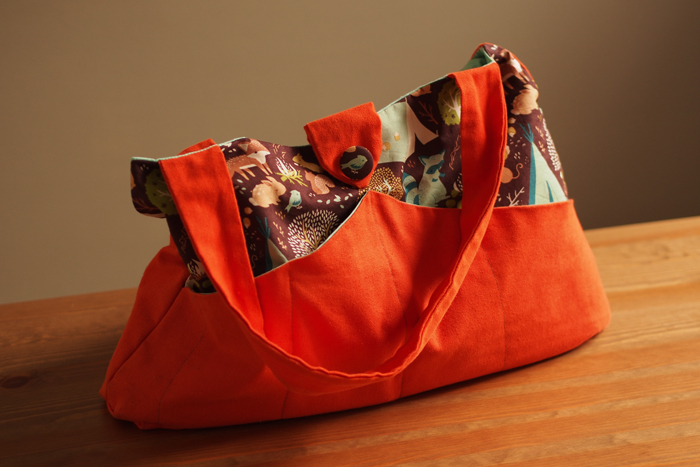 - For a sturdier bag, I would consider adding interfacing to the cotton lining. I did however use a nice sturdy canvas on the outside and am pretty happy with the results. I like that the bag is "baggy". - I'm thinking of maybe fashioning a divider out of sturdy material (felt or thick interfacing) to better separate the bag's contents. I'll let you know if I try it! So. 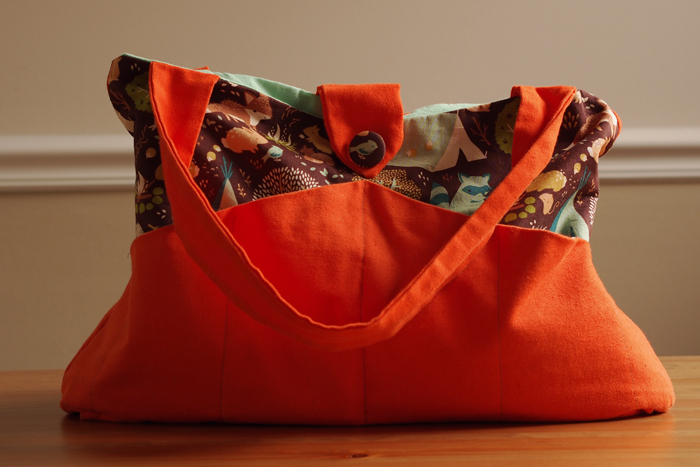 If you are in need of a diaper bag (or just a large bag, really), head over to MakeBabyStuff.com and don't forget to share pictures of what you make! Happy sewing! 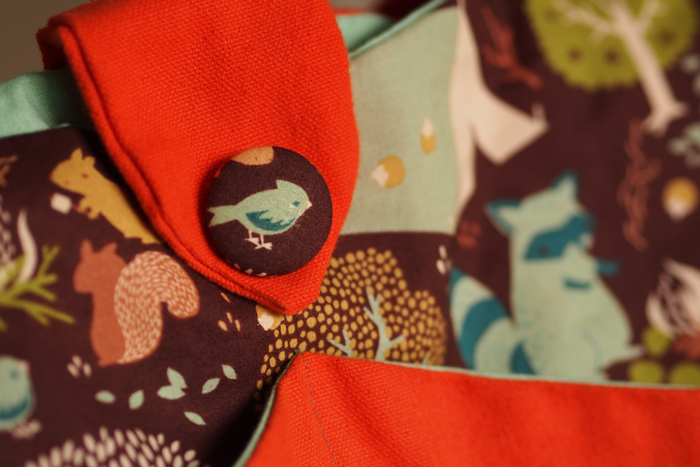 - The lovely patterned fabric is called Critter Camp and is from the Fort Firefly collection created by Teagan White for Birch Fabrics. I bought it from fabricworm, but they seem to be out of this particular pattern at the moment. I love the color combo for the bag! I might have to try this pattern as a camera bag. Ooooh... this would be a great camera bag, especially if you add some dividers for all the different objectives and other camera doo-dads. I'd love to see it if you make it!